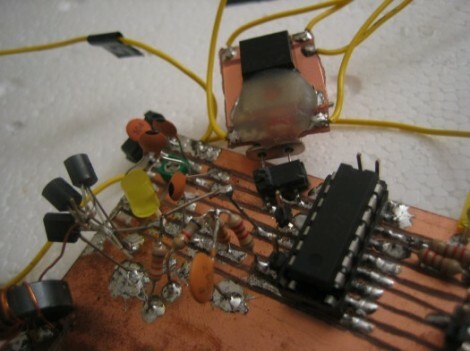 Radio communications depend on stable oscillator frequencies and with that in mind, [Scott Harden] built a module to regulate temperature of a crystal oscillator. The process is outlined in the video after the break but it goes something like this: A small square of double-sided copper-clad board is used as a base. The body of the crystal oscillator is mounted on one side of this base. On the other side there is a mosfet and a thermister. The resistance of the thermister turns the mosfet on and off in an attempt to maintain a steady temperature. This is the first iteration of [Scott’s] crystal oven. It’s being designed for use outdoors, as his indoor setup uses a styrofoam box to insulate the oscillator from ambient temperatures. He’s already working on a second version, and mentioned the incorporation of a Wheatstone bridge but we’ll have to wait to get more details. I’ve had excellent luck using big old power FET heatsinks coupled to Peltier junctions and using foam enclosures over voltage or clock sources. It’s wild to see how controlling temp can increase precision of almost anything, like bridges made from from hand-picked components, or actually getting rated accuracies from crystals. If you put big peltier junctions at the end of the sink and smaller junctions near the payload, you can use multiple temp sensors to regulate temp down to amazingly small fluctuations. You don’t need to be super precise, but the idea is to hold the exterior wings within a degree or two and then use the smaller devices to decrease fluctuations near the core. By using multiple devices, you can get pretty impressive performance and deal with fluctuations. Neat project. I wonder, though, if there might not be a more energy-efficient approach to this. You can tweak a crystal’s frequency with external capacitance. I wonder if it wouldn’t be possible set up a circuit where a temperature sensor (thermistor, silicon diode, or LM34) drives a varactor to trim the crystal frequency. You’d probably need some circuitry in between the sensor and varactor to effect sufficient drive and deliver the proper transfer function, but at least you wouldn’t be throwing away energy as heat. This, of course, would be an important consideration in any battery-powered application. I guess those into radios understand what the crystal oven was going to be, unless the term was hijacke to mean something else. @ pookey in between a simple crystal controlled oscillator, and one that use an oven for the crystal is the temperature compensated crystal oscillator. @pookey: Dallas make exactly this. The part is DS32KHZ. Can be powered directly from a battery consuming just 1uA, accuracy is about +/-2ppm. The frequency is a fixed 32.768Hz though, so not so useful for RF. Well let’s see some crystals then! @bilbao bob: peltier junctions are a smart choice! What size (surface area, really) do you use? Have you checked to see the high and low environmental temperatures where the peltiers hit 100% duty cycle? What the author of this article doesn’t mention is whether (or how) mere mortals can get their hands on SC-cut crystals. The industry-standard AT cut is fine for applications where power is king, but if you’re going to all the trouble of building an OCXO you probably want a flat temperature curve more. I think the affordable solution is probably an AT-cut TCXO IC like @pookey mentioned, under a peltier junction under a heat sink. I think I’d pick Maxim’s DS4026, since you can access its built-in temp sensor over i2c to control the peltier. That gets us down to better than 1 ppm, and if you really want to get fancy you could discipline the oscillator using GPS and/or NIST’s NTP servers. You have to respect this fellow’s homebrew chops, but I think toner-transfer or a small-run PCB print would really help with impedance matching in the output network. Smearing the waveform to kingdom and picking up AM radio with those poking-out wire antennas sort of defeat the purpose. All we want to cool our equipments. Peltier for active temp management is a bit of a drag, because you have to control current in the process, and you have limits to what you can accomplish with that because all a peltier device really consists of is a bunch of thermocouple junctions. If you pass too much current, you’ll melt/blow the joints between the metal junctions. Keep in mind that our application required precise temp control above all else (certain kinds of cells don’t like being hit with XXXX if it gets too warm, and when it’s too cold they don’t want to play nicely) so we had to play games with thermal coefficients and dissipation. In gross form, you use big honking peltier devices on the wings with one side bonded hot and one side bonded cold. You drive them using a big table of sine wave values so that you’re steering the temp and not wasting current fighting the other peltier device. Then you select values from the table based on a log curve and use ordinary PID control to drive it. Then, more towards the center of the device, you stick junctions (again, any junction is a peltier device) and drive those independently. The single junctions allow incredibly fine tweaking. In the ring before that you put your sensing devices, which are very very fast. This allows you to detect rises, which can be mitigated long enough for the big devices to cool it all down if thermal loads start swinging for the bleachers. Probably overkill, but it got the job done. In general, we used ordinary AC to hold temps to within 4-5C range in the room, then a pid controller/fan setup (later abandoned as redundant), then the peltier chamber. The hot side peltier devices used fans (remember, we had room a/c) and the cold side could have used Nitrogen, but we didn’t need that kind of cold. It was sad to see that thing dismantled. Remember, it’s all baby steps until you’ve made all the easy mistakes.